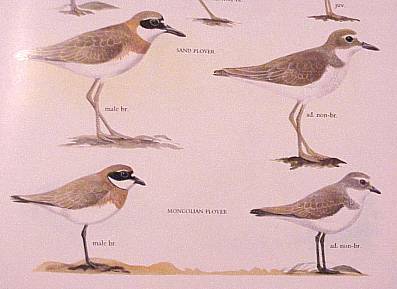 Separating Greater Charadrius leschenaultii and Lesser Sand Plovers Charadrius mongolus is far from simple, especially since the various subspecies of the two show some overlap in morphology. The most important features are considered to be the shape and length of the bill, shape of wingbar and uppertail pattern. Other features worth looking for, although not always conclusive, are leg length and colour. Lesser's bill is normally shorter and more blunt tipped than Greater's. 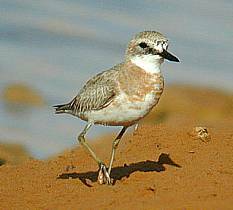 A classic Greater Sand Plover really has a "monster" of a bill compared to any Lesser that you will ever see. The smallest subspecies of Greater's bill gets down to a similar length to that of a large Lesser and that's when one has to look at the "bluntness" of the tip of the bill. Note the "sharp" tip to the bill. With regards the wingbar, both have equally prominent inner wing bars. On the primary bars, the Lesser's wing bar has parallel sides and is reasonably narrow, whereas the Greater's wingbar has unparallel sides and gets wider towards the wing tip, thus giving a far more prominent appearance. 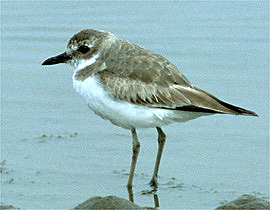 Note the broadening primary bar and dark subterminal band on the tail of the Greater Sand Plover. Lesser's uppertail pattern generally appears uniform brown with maybe some small indications of a white edge to the tail. 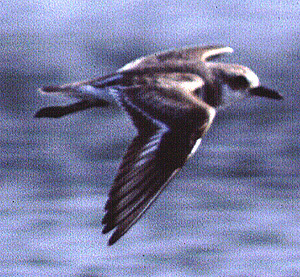 Greater's tail normally shows more white on the outer feathers (although, not always), but the clincher in the tail pattern, is that Greaters always show a prominent dark subterminal band, with the rest of the tail, by contrast, being lighter. Greaters normally have longer legs with a proportionately longer tibia showing. Leg colour in Lessers seems to remain dark grey to black, whereas in Greaters it is almost always lighter grey and can vary through to almost an olive green. Head shape and collar shape have been cited as other useful features, but I have never found these to be of too much help in the field. And they are also separable on call. Note the leg colour and tibia length in the two species. The one thing to remember when trying to separate these birds, or any wader, or in fact any bird at all, is that one has to get the full range of diagnostic features to be sure of what you are looking at. Because of the morphological overlaps in many species, one cannot settle for only 50% of the diagnostic features to identify a bird. ZEST for BIRDS would like to thank Ian Sinclair for allowing permission to use illustrations from the SASOL field guide to the Birds of Southern Africa as well as Alain Fossé, Larry Sansone and Peter LaTourrette for kindly providing the photographs. 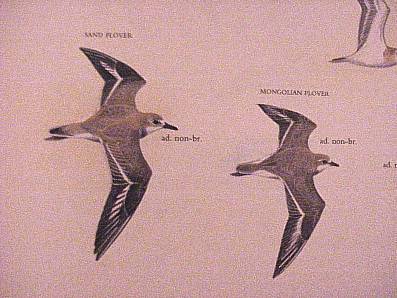 .....more Greater Sand Plover photographs.